We had an ordinary Autumn series until we upped the cleaning schedule on the bottom. After that results returned to normal but not spectacular. An OCS one week cost us four and a half minutes and a wayward Blue fleet last week cost both Passion X and Utopia a good eight minutes. Despite these setbacks we were still in the lead for the combined Spring and Autumn series due to a very good Spring result. By my calculations we were clear of Avalon but wary of their recent stellar performances. With that in mind there was just one strategy to adopt and that was to sit on Avalon. 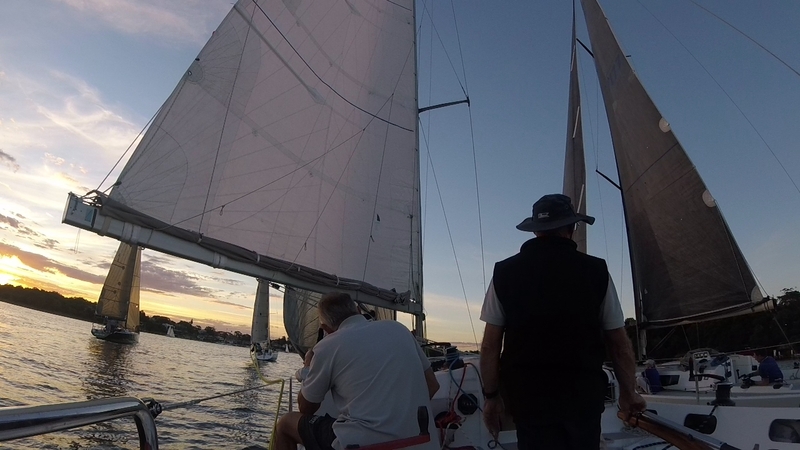 We did manage to time the start well and as the most leeward yacht had a good angle to Onions Point which we reached first by a short half foredeck from one of the J112′s. In Humbug both the J112′s went in close to Greenwich leaving us clear air below. Normally we would have gone wider but Avalon was holding out their genoa to windward and making fast progress up to our stern so we closed the gap but still kept wider of the hill than Joli and Meridian. Being wider helped a lot as we had first use of the breeze and managed to work up under Meridian. We did not mind that Much Ado V went the preferred course even wider and much faster to establish a good lead because we had Avalon tucked back in the dirty air of Passion X and Meridian. As we approached Goat Island both Passion X and Avalon had pulled clear of Meridian. 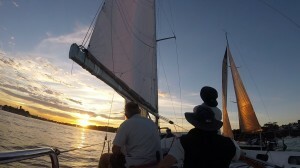 Avalon with only the dirty air of Passion X to contend with was right on out stern approaching the Goat Island shore. We called for water to tack and they called back sooner than I expected with a “you tack” which we were obliged to do. Avalon carried on that extra boat length into the shore and tacked above us with clear air and Starboard rights all the way to the mark. That was the end of sitting on Avalon and the objective now was to stay as close as possible for the second half of the race. We managed that all the way to Long Nose only to come to a halt with no breeze. Dump Truck powered up from behind and went right past and Meridian and Joli followed close behind. Meridian had a nice twist in the leech of the mainsail that seemed to work well in the ultra light and flukey conditions while Joli went in too close to the hill to be a threat. We eased the main halyard to get some twist into the main and as the breeze freshened we picked up speed. The breeze was fresher through Humbug which helped us keep clear of the following fleet including Joli, Jackpot and Lisdillon and further back Ausreo. The good start and sitting on Avalon paid off in the results as Much Ado V picked up the daily double of first and fastest, Lisdillon the second on handicap and Passion X third on handicap. I have not seen the cumulative results yet but the third will improve our Autumn series results and should give us the overall lead for the season. We will just have to wait for the scorer to get the results up. I believe Avalon will be second which is an excellent performance since like all new participants in the club they carried a high handicap for the first three races of the series. Their undoing was to win too many races by too large a margin while the handicap system rewards the plodders who finish around fourth place every week. It was good that Meridian gave us a refresher course in sailing in almost no wind as we are off to Port Stephens next week and the long range forecast is for a very light Monday and Tuesday.